first i should say that i love avocados...pretty much in any form. when i was a kid, my aunt lena had a really big avocado tree in her back yard in southern california. this tree produced massive amounts of avocados. my memory may be faulty...(ya think? )...but i seem to remember avocados year round. she used to give bushels of them away to everyone in the family...so i ate avocados all the time. it wasn't until i was older and met people from outside of california that i realized not everyone was familiar with them. now, with the popularity of guacamole, most people know of avocados..but still have questions regarding their use and their fat content. 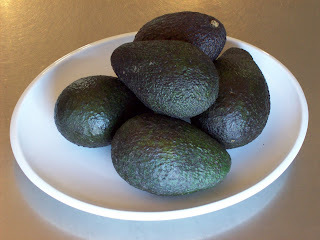 happily, we now know that the fat in an avocado is the good fat and that they are full of fiber and vitamins. i still use avocados all the time. i will spread mashed avocado on toast with a sprinkling of sea salt and eat for lunch or as a snack. i slice and add to salads, omelets, as a taco topping. i cut them in half and fill with tuna, chicken, shrimp, crab or lobster salad, i add them to sandwiches, make avocado salad dressing, avocado soup...hundreds of recipes. but my favorite is guacamole. a friend came to visit last week and brought over a few avocados. she decided to make her guacamole, the simplest version i have ever tasted. she just mashed up the avocados...added a bit of cilantro, salt and pepper and served. it was really good. the avocados were perfectly ripe, the cilantro had a bit of a bite and the flavor was really pure...we gobbled it up. my version uses avocado, finely diced red onion, tomatoes, cilantro, freshly squeezed lime juice, sea salt and diced jalapeño. i don't really used a recipe..i just add the ingredients to taste. i do ensure all the ingredients,including the avocado, stay chunky. i like texture in my guacamole. 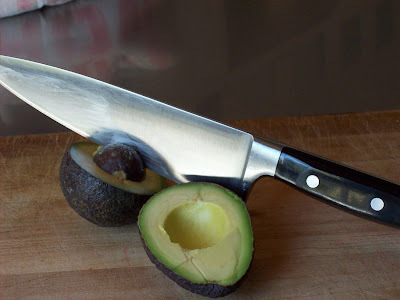 for those of you that have never cut up an avocado, here is a classic and my favorite, technique. 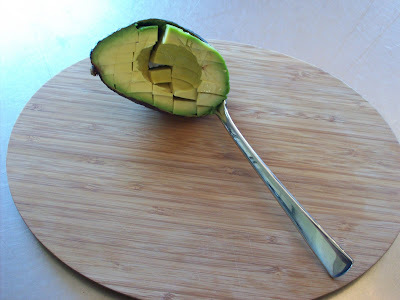 cut the avocado in half lengthwise. there is a big seed in the middle so you will need to cut around it. the seed will stay in one of the halves. use a chef's knife to gently whack the center of the pit so that the knife is slightly embedded in the pit...don't whack too hard or you will cut through the pit...twist the knife, pull out the pit and discard. (note..for safety's sake, put a kitchen towel in the palm of your hand and place the avocado on the towel the first few times you try this technique...be careful!). i spent all day today trying out different versions of the basic recipe (i have a tough life!). i substituted lemon juice for the lime in one batch..and took at least one of my ingredients out of each option to see how it would impact the final result. they all worked so adjust the recipe based on what you like. if you dislike onions...leave them out. hate cilantro? skip (i find that people are seldom neutral regarding cilantro..you either love it or hate it). you will always need salt and the lemon or lime. and, if you are like me, jalapeño or other hot pepper is crucial...otherwise..go for it. 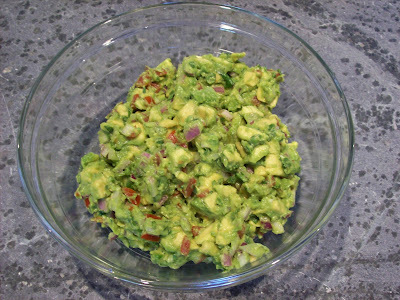 if you have never made guacamole before give this recipe a try. it may become your favorite too. just don't be afraid to experiment with ingredients you like. 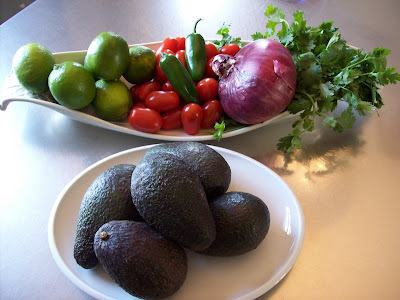 i challenge you to create your own "signature guacamole recipe". oh and since this requires salt and freshly squeezed limes...can you say "pitchers of margaritas"??!! prepare the avocados as described above. add the diced avocados, onion and jalapeños to a medium bowl and stir to combine. gently stir in the tomatoes, cilantro and 1/2 of the lime juice. add a large pinch of sea salt and stir again. taste and add additional lime juice and/or salt if necessary. serve with tortilla chips, on a salad or as part of a taco bar. we are having guacamole tacos for dinner with refried black beans, homemade green chile, corn tortillas and margaritas. want some? 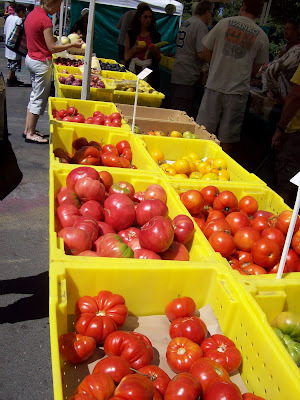 i love farmers' markets...shopping one on a weekly basis is one of my favorite things to do. carrying an overflowing basket of impossibly fresh, beautiful and delicious fruit and vegetables, creating recipes on-the-spot based on what is available, talking with the farmers who actually grow our food, visiting with friends....a perfect, perfect day. 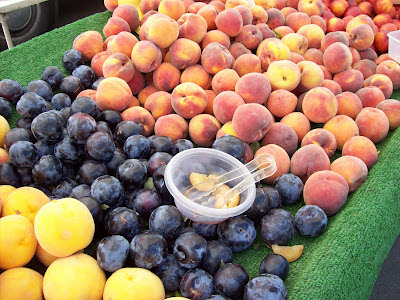 i wish more people would/could support their local farmers' markets. My name is Evan and I'm a senior at UCSB in California who is dedicated to eating organic, locally-grown food. 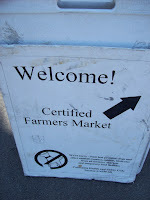 I stumbled across your blog when I was researching data for a farmers' market comparison table that I'm compiling. This database of farmers markets can be narrowed down by location, the type of produce sold, forms of acceptable payment etc. I hope my tool will help shoppers access locally-grown or organic foods they are looking for. Please check it out and let me know what you think. I would really appreciate your feedback!" how cool is this? i so love the fact that this is a school project. it is always such a joy to hear of young adults committed to eating local, organic/sustainably grown food. check out evan's search tool and please let us know what you think in the comments section of this post. i will ensure evan receives your feedback. Find a Farmers' Market Near You!